As a Blue Prism technology partner, ABBYY’s technology enables Blue Prism customers to take advantage of critical content IQ skills making digital workers smarter. ABBYY’s content IQ technologies and solutions automatically classify and extract data turning content into structured, actionable information making your robots and processes smarter, dramatically improving the customer experience, and increasing operational efficiency. Accelerate processes for any kind of business document – applications, claims, orders, and communications – eliminating costly and time-consuming manual operations. Turn your robots into compliance officers, by transforming critical documents into structured information, ensuring your robots have the required data to complete the work in a timely manner, while complying with regulations. Expand RPA use cases to content centric processes, supporting strategic digital transformation initiatives across the entire organization. Turn robots into the next class of digital workers by providing content skills that deliver fast usable data, eliminating manual work and lengthy document review processes. Learn how ABBYY FlexiCapture integrates with Blue Prism, automating the classification and extraction of data from documents. 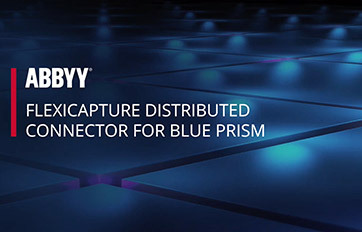 Add intelligence to the processing of unstructured content with instant connection to ABBYY’s intelligent capture solutions – all while building a process within Blue Prism. Leverage leading OCR, document classification and data extraction technologies to automate document centric processes. Automate the classification of documents and extraction of data, through continuous auto-learning, and user input. Expand RPA usage to automate content centric processes involving documents, images, and text to support strategic digital transformation initiatives. Download the FlexiCapture connector to Blue Prism and begin automating high-value document processes. Learn more about ABBYY products.